When this card is successfully Normal Summoned, Flip Summoned or Special Summoned put 1 Spell Counter on a face-up card on the field that you can put a Spell Counter on. If this card is destroyed in battle, you can select 1 Spellcaster-Type monster Level 2 or lower from your deck and Special Summon it on the field in face-down Defense Position. Apprentice Magician is an interesting card with some nice effects. Adding Spell Counters is always good for things like Breaker the Magical Warrior, Skilled Dark Magician, Skilled White Magician and Magical Marionette among other things. However, the Special Summoning effect is what makes this card so good. The list of Level 2 or lower Spellcasters include another Apprentice Magician, Vindictive Old Magician, Magical Scientist, Magician of Faith, Magical Plant Mandragola, Time Wizard, Exodia Limbs (except the Head), Mystic Lamp, Witch's Apprentice, The Unhappy Maiden and Thousand-Eyes Idol. Being able to keep monsters on the field to protect your Life Points is always a good thing but the fact that this makes Magician of Faith so much more reliable is what makes this so dangerous. Even if your opponent uses Change of Heart in Main Phase 2, he/she can't Flip Summon Magician of Faith because it was summoned on the current turn and cannot have its position manually changed. Using Raigeki or Dark Hole on it in Main Phase 2 is also an enormous waste. Of course, other prime candidates are Magical Scientist and Vindictive Old Magician. This monster is also easily brought out with Witch, Sangan, Mystic Tomato and Last Will. Apprentice Magician is a weakling though so pretty much anything can run it over. The Spell Counter adding effect, according to the wording, can also be used on your opponent's monsters if you have no eligible monsters. The effect seems to be mandatory but we'll have to wait for the ruling. This monster is an excellent utility monster. It can't kill anything but it can help set you up for the big kill. This would work very well in any deck based on 1 or more Spellcasters (Scientist, Dark Magician, Magical Marionette etc) but can be useful in any deck that uses Spell Counters. Effect: When this card is successfully Normal Summoned, Flip Summoned or Special Summoned put 1 Spell Counter on a face-up card on the field that you can put a Spell Counter on. If this card is destroyed in battle, you can select 1 Spellcaster-Type monster Level 2 or lower from your deck and Special Summon it on the field in face-down Defense Position. Being able to put a Spell Counter back onto Dark Paladin is going to be this Monsters best use right now. It could help out with Magical Marionette but he should be able to acquire Spell Counters on his own easily enough. It's very nice that the Effect works when Summoned in any way, it would be even better if that was the way Breaker worked. I hate when specific Effect only work when the Monster is destroyed in battle, because all the opponent has to do is destroy it via Monster, Spell or Trap Effect. If you do manage to get Apprentice destroyed in battle though you can pull out a couple different Monsters depending on the situation of the Field. Besides being able to Summon another Apprentice Magician when destroyed in battle, it can also grab an Old Vindictive Magician, Pixie Knight, Magical Plant Mandragola, Magical Scientist, Thousand-Eyes Idol (why? I don't know), Exodias Limbs (another odd one), Mystic Lamp, Magician of Faith, Time Wizard, Witch's Apprentice and The Unhappy Maiden. As for unreleased Lv.2 Spellcasters there won't be any in Dark Crisis, but there are a couple in the sets and Promos after like Chaos Curser, Dark Eyes Illusionist and Mimic Illusionist. You can pull of a couple neat combos or just get a Magician Of Faith on the Field quickly, but his Effect will probably be used most often to Summon another Apprentice or Magical Plant to get more Spell Counters for certain Monsters. So if you're using any Spell Counter associated cards than Apprentice Magician can help out, but if you're not than this card is dead weight with no fighting abilities. ArtWork: 1.0 - In my opinion this is a very corny looking Magician, at least when you compare it to the other Magicians that came out in MFC. Hmmm, here is an interesting little rare. Spell counters are not all that viable; however there are some cards this could prove useful with. A Dark Magician/Paladin deck is the first that comes to mind. It can help speed up the Skilled Magicians, or Breaker for added Magic/Trap removal. 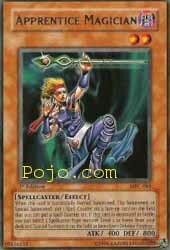 There is also Miracle Restoring to get Dark Magician or Buster Blader’s back from the grave. As for its second effect you could initiate a loop, and get another copy of Apprentice Magician, or get the Spellcaster Version of Man Eater Bug, Old Vindictive Magician.